The family get-togethers to provide sufficient opportunities to members and their families to interact each other and an atmosphere to unwind themselves from hectic lives. The Club conduct family get-togethers almost every month by organizing medical seminars, cultural programs, games for children and adults, delicious food, bingo etc. On 26th January the Club celebrate Indian Republic Day, by a flag hoisting ceremony. Consular representative attend the ceremony. ISC Dance & Music Academy conducts the “Arangettam” (1st stage recital) for the Classical Dance students of ISC Dance & Music Academy. ‘The Festival of Colors‘ was celebrate under the initiative of the Ladies Forum and Executive Committee at Marine Club or Madab Park. It is a full day outdoors program with participation of more than 200 members. Everybody enjoy throwing color powders and splashing color liquids on each other and enjoy the lunch. The Club conduct a full day free medical camp, by providing free blood sugar / BP test, free consultation facilities by qualified Doctors and offering free medicines to the needy people in the East Coast. Nearly 200 people attend the medical camp and it usually becomes a huge success. It is one of the mega attractions of the Club. 2500 students from 5 schools of the East Coast participate in 35 items each items separately categorized for KG / Sub-junior / Junior / Senior / Common categories. Offstage items conduct at Our Own English High School Fujairah or Indian School Fujairah and the rest of the programs conduct at ISC auditorium and the ISC mini hall. It is a great challenge for the committee members to conduct the 3 week long multi-venue event on schedule as the turn out for each and every competition is tremendous. The tremendous efforts by entire Executive Committee, Cultural Sub- Committee and the ladies forum under contribute to the success of the festival. The sports team, conduct an internal badminton tournament every year. The event always turn out be an impressive one. Ladies forum organize a picnic, exclusively for ladies and children, to nearby Parks. ISC conduct summer camp under the initiative of the sports wing. The 45 days long camp was attend by about 70 students. Various interactive sessions and short term courses in personality development, physical training, Kung Fu, badminton, Arabic and Malayalam language, arts and crafts, glass painting, henna designing, etc., are provided to the campers. The Club celebrate the Indian Independence Day . National Flag hoist in the morning by Consulate Representative. Sweets distribute among all present. A colorful cultural program usually conduct in the evening. The Club conduct the annual Iftar Meet in which more than 200 members take part. The Club celebrate Onam, the Harvest festival of Kerala, Competitions in Pookalam (floral decoration), Henna Designing and Kudam Tallu are conducted. Nearly 500 members enjoy the Onam Sadya prepare at the Club premises itself or served by a nearby restaurent. Children of ISC Dance & Music Academy perform traditional dances in the colorful cultural evening. The ‘Festival of Lights‘ was celebrate under the canopy of the Ladies Forum . Nearly 200 members enjoy an experience entirely different from the usual outdoor events. The 3 weeks long event conduct by the Club showcase some outstanding top seed players from India as well as UAE. It is a classic display of International players and India‘s top-seeded players. An active participation of members witness and support this event. ISC Ladies Forum the Children’s Day, at the club auditorium. Nearly 100 children participate in the fun filled event where they could watch movies, doing face paints and enjoy lots of snacks and games. 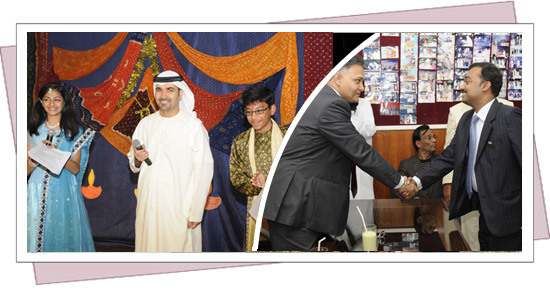 The annual Food & Fun Fair of the Club conduct at Fujairah International Marine Club. The two days of outdoor programs witness by not less than 5000 people. A good crowd visit the huge variety of food stalls to taste the home-made delicacies which are mostly sold out. People enjoy the cultural program on both days, which is a mixture of different programs such as magic show, orchestra, dances, etc. Nearly 80 students are provided with regular professional coaching in classical and cinematic dances under the guidance of Kalashekthram Hari Master and Prabheesh Master. Around 50 children benefit from the regular coaching in Badminton provided by the Club’s professional instructor Mr.Venu.